With the 100th anniversary of the launch – and sinking – of the Titanic on the horizon, expect plenty of related materials to hit the marketplace. The biggest comes from the 3D re-release of the 1997 film - and its Blu-ray issue later in 2012, one would assume – but any others will emerge as well. On Titanic: The Complete Story, we find a nice compilation of documentaries about the tragedy, some of which actually predated the James Cameron hit. This two-DVD set includes three programs, each of which lasts a little more than 90 minutes. However, the first two really should be considered as one long piece. From 1994, “Death of a Dream” and “The Legend Lives On” aired on two different dates but they function as a whole; you can enjoy each alone, but they need to be viewed together to provide the full story. ”Dream” comes first in the chronology. It follows the origins of the ship and follows its building in Ireland. It then shows us the vessel’s entire voyage, at least through the first stages of the sinking. We watch as the boat hits the iceberg and then see much of the rescue efforts that took place on board; by the end of the show, all of the lifeboats are deployed, but it halts at that point. ”Legend” picks up at that point and shows the rest of the story. It displays the immediate reactions as the news hit back in America and elsewhere, and it also continues with the final moments of the boat as well as the rescue. We then watch the aftermath as it affected survivors and the world at large. Both programs are told via identical methods. 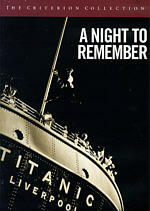 Narrated by David McCallum - who acted in A Night to Remember, one of the more famous Titanic films - the visuals display a mix of illustrative art of the journey and sinking, archival photos and footage from the period, and modern interviews with a wide mix of subjects. The programs include comments from survivors - not surprisingly, all of them female - as well as a nice array of Titanic historians and scientists. The latter include well-known writers like author Walter Lord, who created A Night to Remember, the text on which the 1958 film was based. In addition to these materials, we hear voiceovers that provide writings from Titanic survivors. These add a nice historical perspective that demonstrates the mindset from the period; that complements the new comments from survivors. It’s a broad and representative roster that seems very solid and complete. At times, “Dream” comes across as somewhat dry, especially during its first two-thirds or so. The show progresses at an appropriate rate and covers all of the material quite cleanly and accurately, but it could seem a little uninvolving at times. The information is very useful and worthwhile, but during these times, the presentation comes across as somewhat flat. To my moderate surprise, the program becomes much more involving as the boat sinks. I suppose this shouldn’t be a shock, as that’s when all the real drama begins, but I thought the style of presentation would ensure that the whole show would stay unemotional. That isn’t the case. Instead, as the disaster unfolds, the material seems more and more moving and evocative. I can’t say I’m wild about the use of the voice-overs in general, but they work well here. Overall, the presentation seems very workable, as it covers the material efficiently but keeps from appearing too clinical. Again, it came across that way at times prior to the sinking, but once those elements begin, the show gets more and more riveting. It’s a surprise how much emotion it wrenches from such a seemingly bland format. ”Legend” continues that tone as it follows the aftermath. At times it straddles the edge of becoming excessively syrupy, but it never crosses that line. The music swells a little too much on occasion, but it still remains tasteful and effective. The voice acting seems good, and the mix of third-party historians and first-party survivors makes this a nice combination of sources. The combination of “Dream” and “Legend” creates a very rich and fulfilling look at the history of the ship and its demise. 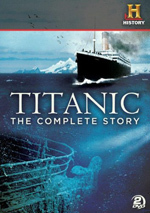 Called “Beyond Titanic”, the third program bears no direct connection to the first two. Created in 1998 - after the success of the Cameron flick and co-sponsored by Fox - this show follows the ways in which the Titanic has remained in the popular culture over the prior 86 years. Narrated by Victor Garber - who played ship designer Thomas Andrews in Titanic - the program briefly recaps the rescue of survivors and the ensuing news coverage. After that, it offers a reasonably detailed history of the disaster’s continued impact on popular culture. We hear mainly about cinematic depictions; those began almost immediately with some quick silent films from the era. Some time is devoted to books and other media - such as a CD-ROM exploration of the ship - but movies dominate the show. The program traces additional offerings through the years and also briefly relates the ways in which the Titanic legend fit into the mindsets of the times. Some of the same participants show up in both programs, but “Beyond” gives us a smattering of new speakers. One of the most interesting elements comes from a repeat survivor. Though an infant during the voyage, Millvina Dean remains haunted by the tragedy, largely due to the loss of her father. She states that she and other survivors went to see A Night to Remember back in 1958 but found the experience to be an emotional ordeal. As such, she and others refuse to watch any other Titanic-oriented flicks, which leads to an amusing story about all the attempts folks made to get her to a screening of Titanic. Surprisingly, we don’t hear all that much about that movie. Since Fox sponsored the show, I expected a focus on the then current hit, but happily, it receives an appropriate amount of attention. Neither favored nor ignored, we learn of it as another piece in the continuing puzzle. “Beyond” is a good program, but I must admit it’s my least favorite of the three. It lacks the depth of the first two shows and seems a bit bland at times. Still, it largely covers new territory; some of the material is redundant after the first programs, but most of it is exclusive to “Beyond”. It offers a good capper to the proceedings even if it isn’t as involving as the first two-thirds of the DVD. While I don’t know if its title is totally accurate, Titanic: The Complete Story does offer a very solid examination of the events in question. It traces the history of the doomed ship from its inception through its sinking to its continued influence on the culture. While parts of it seem a little dry at times, for the most part the program comes across as quite involving and often moving. Ultimately this is a very nice compilation of documentaries that should be very useful and entertaining for anyone with an interest in the Titanic. 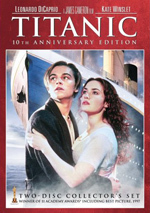 Titanic: The Complete Story appears in an aspect ratio of 1.33:1 on these single-sided, double-layered DVDs; due to those dimensions, the image has not been enhanced for 16X9 televisions. While not a bad picture, it demonstrated a mix of concerns that made it seem fairly average for the most part. Sharpness appeared acceptable but unspectacular. The picture consistently seemed to be reasonably accurate and clear but it lacked any great detail or definition. Jagged edges and moiré effects caused no specific concerns, but edge enhancement was a definite distraction. That element cropped up many times during the program and could become quite heavy at times. Other than some vague artifacting - most evident during the videotaped interviews - the DVD seemed free of most source flaws, at least in regard to the modern material. Inevitably, archival footage showed a slew of defects, but I didn’t factor them into my grade since they made up a minor portion of the package. Colors generally looked decent though bland. The hues were relatively clear and bright, but they failed to display much distinction or vividness. The same went for black levels, which appeared reasonably deep but somewhat murky and muddy at times. Shadow detail was fine, mainly because it wasn’t much of an issue; the interviews were shot in such a way that we didn’t see many dimly lit sequences. Overall, Titanic: The Complete Story offered an acceptable picture, but it seemed moderately flawed nonetheless. While the Dolby Surround 2.0 soundtrack of Titanic: The Complete Story demonstrated few overt defects, it still came across as fairly average, mainly due to the unambitious sound design. The first two programs - “Death of a Dream” and “The Legend Lives On” - seemed to be glorified monaural. Some very light audio emanated from the front side speakers, but for all intents and purposes, the sound remained focused within the forward center channel. I found it very difficult to discern any stereo imaging unless I put my head right up against the side speakers. As for “Beyond Titanic”, it provided a broader affair. It actually utilized all five speakers, though you’ll be forgiven if you believe that it remained strictly a stereo presentation. The music spread fairly effectively across the front speakers and also came from the rears, but the latter didn’t make much of an impact. Again, I needed to put my head close to the surrounds to tell if they were utilized. They were, but the focus stayed heavily on the front channels. While not excellent stereo, the additional breadth heard during “Beyond” was a welcome change after the monaural emphasis of the first two shows. Audio quality appeared fine across the board. Dialogue sounded natural and warm, with no signs of edginess or problems related to intelligibility. (As with the picture grade, my statements relate to the modern elements found in the documentary; I didn’t factor in the archival footage, since it made up a very minor portion of the DVDs.) Music lacked tremendous definition, but the score seemed acceptably clear and vibrant for the most part, with clean highs and moderately rich lows. Effects stayed in the background during most of the program; they occasionally offered general ambience, but they usually didn’t emerge from that status. Still, they appeared accurate and distinct, with no issues related to distortion or other problems. Overall, the audio for Titanic: The Complete Story seemed utilitarian but more than acceptable for this sort of program. How did this 2012 release of Complete Story compare to the original DVDs from 2002? The two are identical – literally. The 2012 version simply repackages the old discs to get it back on the market for the 100th anniversary. A few very minor extras round out the set. 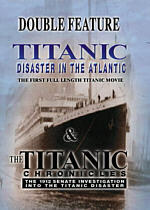 On DVD One, we discover a timeline that follows the history of the Titanic. It starts with the 1867 purchase of the White Star Line by Thomas Ismay - father of Bruce, noted scapegoat - and progresses through the May 2, 1912 results of the British Board of Trade inquiry. There’s not much you won’t already hear in the programs themselves, but this offers a decent synopsis of major events. On DVD Two, we find a couple of additional pieces, both of which are also text-based. Key Passengers lists 12 notable Titanic inhabitants and lists extremely rudimentary details about them. Essay: The Titanic In Pop Culture essentially just offers a print summary of “Beyond Titanic”. It doesn’t add anything we didn’t already learn in the documentary. Neither of these extras contributes much to the package. Still, even without substantial supplements, Titanic: The Complete Story offers a nice piece of work. The three documentaries have some slow spots, but as a whole, they give us a rich, satisfying and moving look at the whole history of the ship. Picture and sound are fairly bland, and as noted, the package lacks any substantial extras. Nonetheless, I was impressed by The Complete Story. It largely lives up to its own hyperbolic title, and it should be greatly enjoyed by those with an interest in the Titanic. As I noted earlier, this DVD set offers an identical reproduction of the package that came out 10 years earlier. If you already own that one, there’s no reason to get the 2012 version.